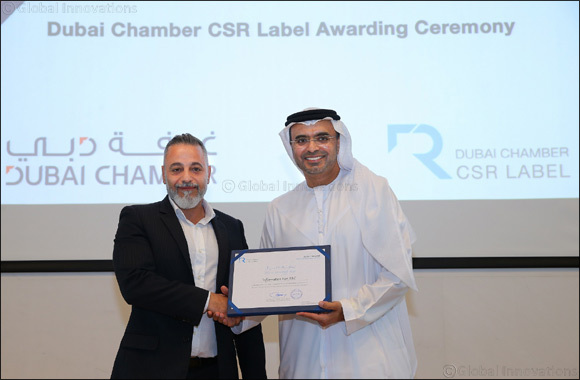 Dubai, UAE, April 16, 2018: InfoFort, an Aramex company and a leading information management solution provider in the Middle East and Africa, was awarded the Dubai Chamber CSR Label for the fifth consecutive year. The initiative established by Dubai Chamber of Commerce and Industry aims to encourage and honour outstanding companies for their CSR and sustainability efforts. InfoFort was recognized for its exemplary workplace practices and extensive involvement in the community. Over the years, InfoFort has invested in education to reduce youth unemployment rates and undertaken several recycling initiatives to reduce carbon footprint in the region. Furthermore, as an equal opportunities employer, InfoFort recognizes diversity of people, ideas, talents and experiences as one of its core values.